Pay Tribute to the 120th Anniversary of Remote Control With Sold-Out Silver Coin! Thanks to modern technology, we don’t have to direct our kids to change the channel for us like our parents did. We simply pick up a little hand-held device and change the channel by remote control. The “remote” may seem like a relatively new innovation, but in fact it was first debuted by renowned Serbian-American inventor Nikola Tesla at the Electrical Exhibition of 1898 held in New York City’s Madison Square Garden. In honor of the 120th anniversary of this groundbreaking invention, Serbia has issued the second release in its series of coins commemorating the genius of Nikola Tesla. These legal-tender coins are struck in a full ounce of highly-pure 99.99% silver and feature not only the image of the scientific pioneer, but one of his greatest discoveries – the radio-controlled boat he used to demonstrate his invention. The low-lying steal craft was about four feet in length and easily skimmed across a small pool of water in a tour de force that cemented Tesla’s patent for his work. Tesla had hoped that the United States Navy would buy the idea of his remote-controlled boats but was rejected by the Navy Brass on the grounds that they thought the technology was too flimsy for war. Ironically, less than two decades later the German navy used remotely controlled boats loaded with explosives to attack Allied ships during World War I. Your 2019 Serbia Nikola Tesla Remote Control One-Ounce Silver Coin has been graded by the Numismatic Guaranty Corporation (NGC) as being in near-perfect Mint State-69 (MS69) condition, a distinction that means your almost-flawless coin will showcase an impressive full strike and indistinguishable imperfections – well above and beyond the quality of the vast majority of coins in the series. In addition, NGC has graded your coin to be a First Releases (FR) coin, a designation that means it was received by NGC or an NGC-approved depository within the first 30 days of the its release. It will come sonically sealed in an acrylic holder with an exclusive Nikola Tesla label. You’d think with a résumé such as his that Tesla’s name would be a household word. Unfortunately, Tesla sold most of his patents, and the fame generated by his discoveries was bestowed onto others. Discarded and forgotten, he died in 1943 alone and penniless in a New York City hotel. It wasn’t until a 2017 episode of the hit CBS comedy “Big Bang Theory” that Tesla’s name started to get its due among the general public. During the episode, the gang debates whether they are “Teslas,” who make their own discoveries, or “Edisons,” who build upon existing research. The spike in Google searches about Tesla was felt immediately. Tesla and his remarkable invention take center stage on this beautiful coin. History buffs, science aficionados and silver stackers alike are sure to appreciate the design and high silver content. Just 50,000 of these coins have been struck and they are completely sold out at the mint! Don’t wait – get one for yourself and several others for the budding scientists in your life. Add them to your cart today! COMMEMORATIVE DESIGN OF ONE OF THE WORLD’S GREATEST INVENTORS – Though he made most of his discoveries after immigrating to the United States in 1884, Nikola Tesla was born in a region of Serbia that is now part of Croatia. The former Serb is commemorated on the obverse of the stunning silver coin released by the prestigious National Bank of Serbia. The coin’s reverse features one of his most famous inventions: the teleautomaton – a wireless remote-controlled boat. The design also features the patent number and date of patent US 613809A NOV 8. 1898. Inscribed above the design is 120th ANNIVERSARY REMOTE CONTROL. STRUCK IN HIGHLY PURE SILVER – These 2019 Serbia Nikola Tesla Remote Control Silver Coins were struck in an ounce of highly pure 99.99% silver. LEGAL-TENDER COINAGE – Each Nikola Tesla One-Ounce Silver Coin is 100 Dinara legal tender in Serbia. 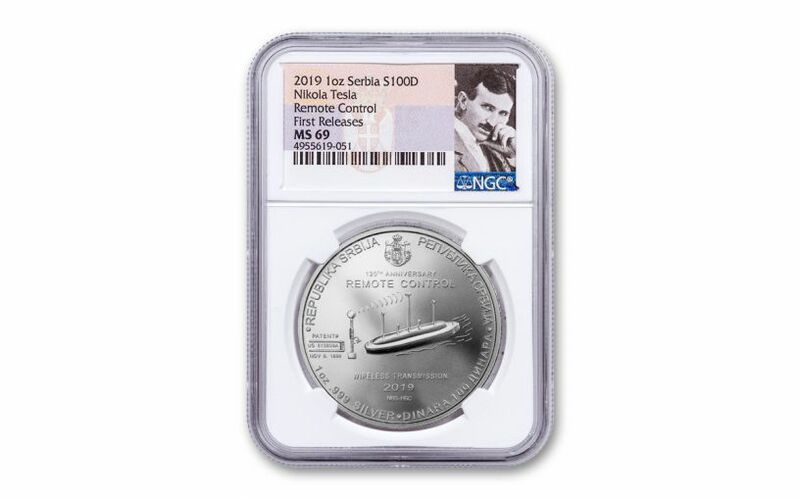 GRADED IN NEAR-PERFECT UNCIRCULATED CONDITION – Your 2019 Serbia Nikola Tesla Remote Control One-Ounce Silver Coin has been graded by the Numismatic Guaranty Corporation (NGC) as being in near-perfect Mint State-69 (MS69) condition, a distinction that means your almost-flawless coin will showcase an impressive full strike and indistinguishable imperfections – well above and beyond the quality of the vast majority of coins in the series. KEY FIRST RELEASES CERTIFICATION – NGC has graded your coin to be a First Releases (FR) coin, a designation that means it was received by NGC or an NGC-approved depository within the first 30 days of the its release. It will come sonically sealed in an acrylic holder with an exclusive Nikola Tesla label. SOLD-OUT LIMITED WORLDWIDE MINTAGE – The Serbian Mint has set a maximum worldwide mintage for this coin at just 50,000 – and they are completely sold out at the mint! Science enthusiasts, history buffs and silver stackers alike will all be vying to get their hands on this magnificent coin. Make sure you don’t end up on the outside looking in, reserve one – or several – today!